Teaching kids how to be kind and grateful is so much harder than just telling them to share and be polite. It takes daily effort, but simple acts add up and it’s much easier to fit into your life than you think. In our house we focus on acts of kindness after having had a really profound experience counting down to Christmas with random acts of Christmas kindness a few years ago. I knew it would be “good” for all of us at the time, but I really underestimated just how much focusing on kindness would allow us to slow down and connect as a family during a very busy time of year. I believe in being kind and grateful each day, but there really is something to be said for slowing down and intentionally focusing on it. One of my Facebook followers had suggested doing 30 Days of Gratitude and I jumped all over it! 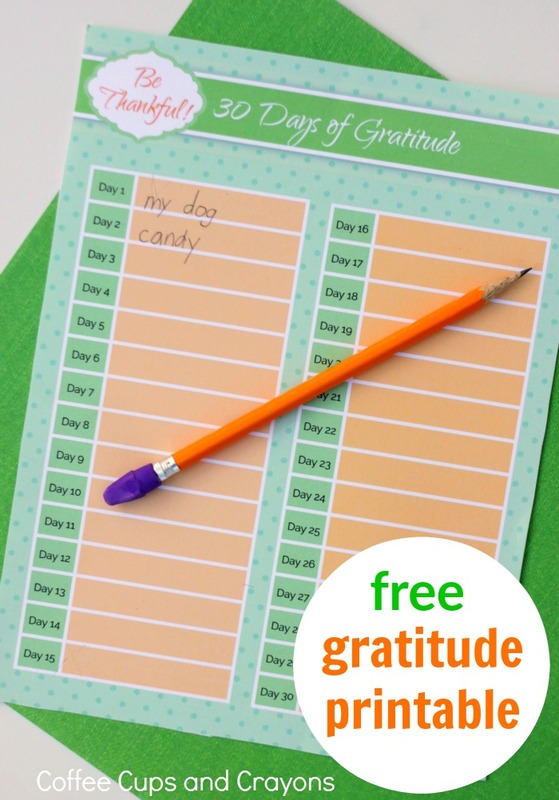 It’s so easy for thankfulness to get lost in the shuffle of the busy holiday season so I made a gratitude printable to make it really easy to teach kids to be grateful. Print a copy off for each member of your family or classroom to fill out for 30 days. We are going to fill ours out this November during the Thanksgiving season, but it really can be done year round. Start anytime you feel overwhelmed by life. That’s always a great time to step back and focus on what really matters to you. There are 30 days listed on the printable instead of 30 blanks for a reason. While it is great to make a nice long list of all the things you are grateful for it won’t have as much of an impact on your life as writing something down each day. It also isn’t in the form of a calendar for a reason too. Life happens and sometimes things get skipped. Just pick up where you left off when you remember. We are moving in a couple weeks and have too many events going on at school. 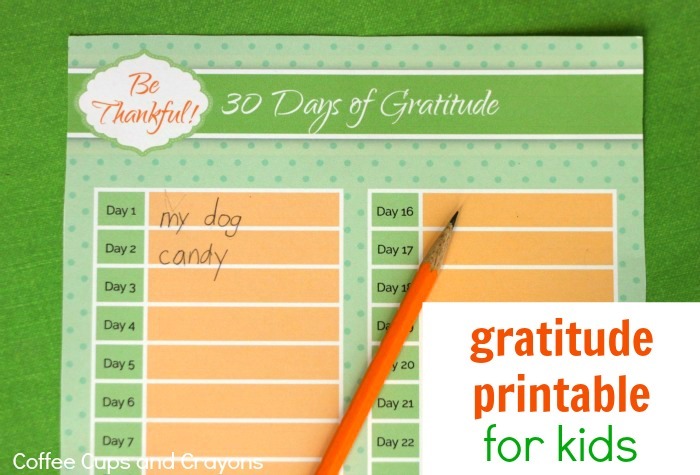 I am excited to focus on 30 days of gratitude with my kids to make sure we are keeping things in perspective. It also sneaks in some authentic writing practice for the kids which is always a good thing! 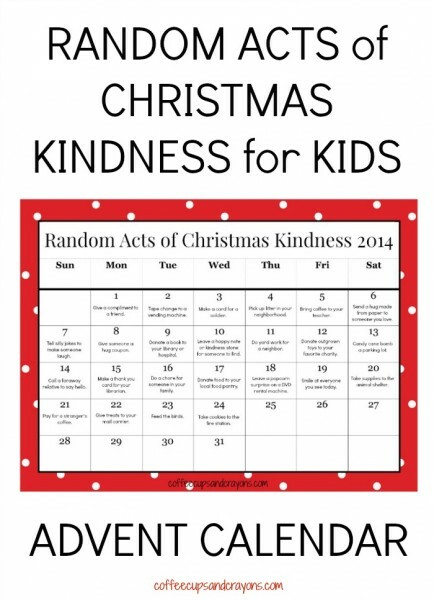 If you love this easy way to teach kids to be grateful then you need to see our Random Acts of Christmas Kindness calender! I’m going to try the 30 days of gratitude with my husband and daughter, Megan. Thanks! Yay! We really need something like this this year, I’m glad you can use it too! I shared your post today! Thanks for this resource.